Radiographer are not allowed to interpret radiographic films. But to be able to acquire a high quality radiograph, Radiogapher should know some basic reading technique before giving the film to radiologist for official diagnosis. Here are some basic systematic approach is use when starting to interpret chest xray and along with some basic knowledge of the anatomy, this will help to make you don’t have to miss any key of abnormalities. First of all you need to have a quick check to confirm the identity of the patient and comment to the orientation of the film, if it is PA or AP. Often this useful information maybe written on the upper right side of the image. In terms of image quality, ask yourself if you can see everything you need to know in the radiograph. Then check for the 3 aspects using the mnemonics RIP. The spinous process should be at the midpoint between the middle ends of the clavicles. The degree which xray pass through the body. Is the spine visible behind the heart? If there is a clear area of abnormality don’t hesitate to highlight it first. But remember to go through systematically afterwards to check if you haven’t miss anything. Start with trachea and work to way down. The trachea contains air so its blacker than the surroundings. Check if it is centrally position or deviated to one side. The trachea can be pulled toward the side of collapse lung or push away from the side of tension pneumothorax. When describing a chest xray the lungs are divided into upper, middle and lower zones. Note that this not correlates to the lung lobes. Look at each of the lung zone in turn for symmetry, then compare each zone to the opposite side do any area look too black or too white? If so, you can decide which is the abnormal side. Make sure you can see lung marking going all the way to the edge of the chest wall. If you can see the edge with black area surrounding, it suspects a pneumothorax. Note the pleura is not visible in healthy people. Look at the ribs, clavicles, proximal end of the humerus and to the thoracic spine. Check for the evidence of the fracture or metastatic deposits and examine the shoulder joints for the signs of artritis or dislocated joints. Look at the size, shape and borders of the heart in the mediastinum. Heart size is use to assess in cardiothoracic ratio. In a PA film the heart occupies less than 50 percent of the width of the thorax. A cardiothoracic ratio of greater than 50 percent in a PA view is abnormal and indicates cardiomegaly. 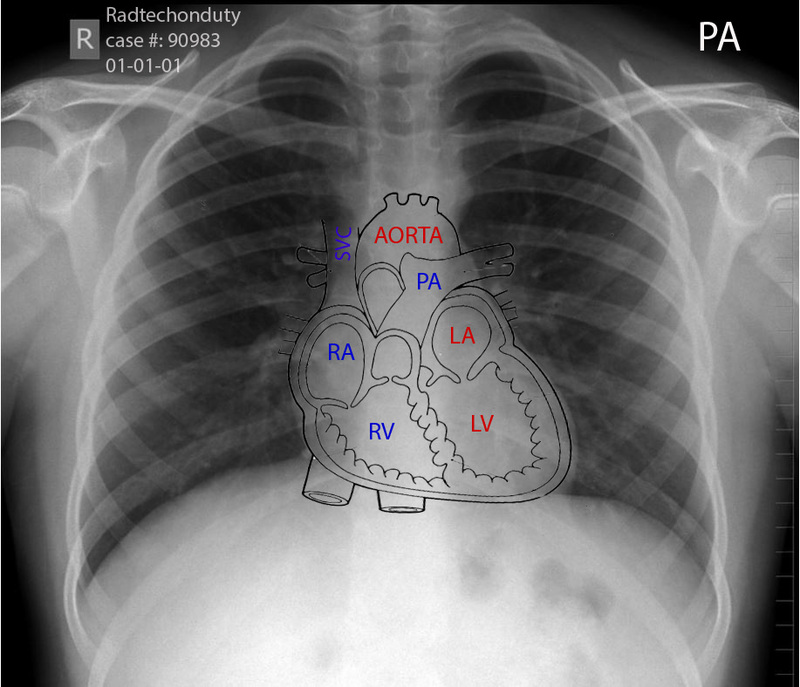 Structures making up on the left border of the mediastinum includes the aortic knuckle, pulmonary outflow tract, left atrial appendage and left ventricle. On the right side the border includes the superior vena cava, right atrium and inferior vena cava. This border should be well define. A blood edge could indicate a collapse or consolidation of the lung. Each side of the diaphragm should appear as a dome, with the sharp point edge against the adjacent black lung. The right hemi diaphragm is normally higher than the left by about 1 to 3 cm due to the liver underneath. The costophrenic angle as the area were diaphragm meets with ribs rapturously. The cardiophrenic angle is where heart meets the diaphragm this angle should be clearly defined. Often you’ll see the gastric air bubble under the left hemi diaphragm. Look for evidence of medical intervention for example monitoring equipment, line and tubes are they correctly positioned. 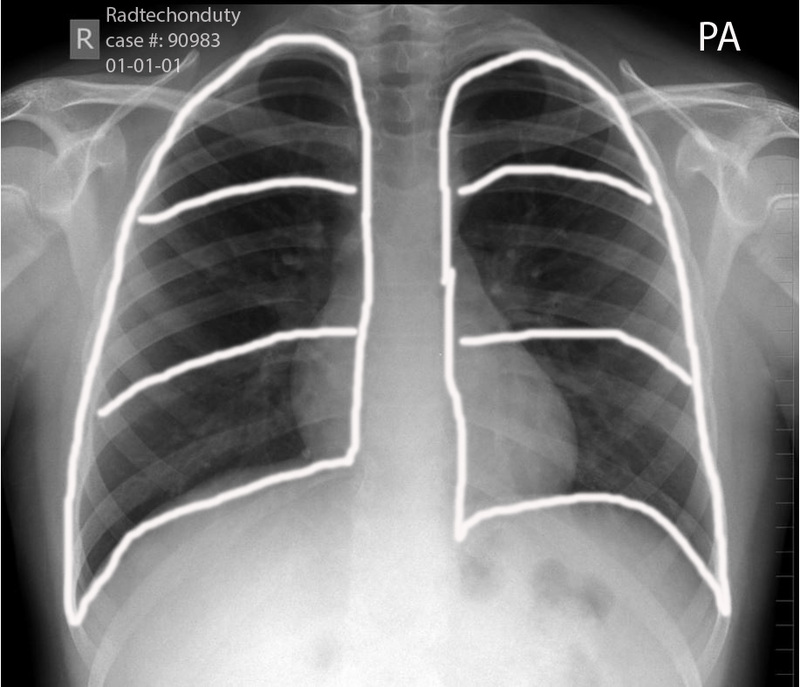 If the chest xray appears normal so far, pay attention to the review areas. The long apices, and the hilar regions. This are the major bronchi and major pulmonary vessels, the left hilum is higher than the right or the same level they should symmetrical in size and density, look behind the heart a shadowing appearance of the spine should be visible. Check for soft tissue finely revealed under the diaphragm.